Written on January 17, 2012 . Posted in Liberal Arts, Updates from & for Faculty. Matthew Landrus (Lecturer, History of Art + Visual Culture) will give the paper ‘Mechanical arts and the medieval military treatise, from Vegetius to Valturio,’ at the International Congress on Medieval Studies to take place at the University of Michigan, Kalamazoo, 2012. He will speak on ‘The Codex Huygens and Leonardo da Vinci’s book on human movements,’ Leonardo da Vinci’s ‘Treatise on Painting,’ at the University of Virginia, Charlottesville. he will also present ‘Mathematics and Proportion Theories among Artist/Engineers at the Turn of the Sixteenth Century,’ for the session, Visual Culture and Mathematics in the Early Modern Period, at the College Art Association Conference soon to take place in Los Angeles. 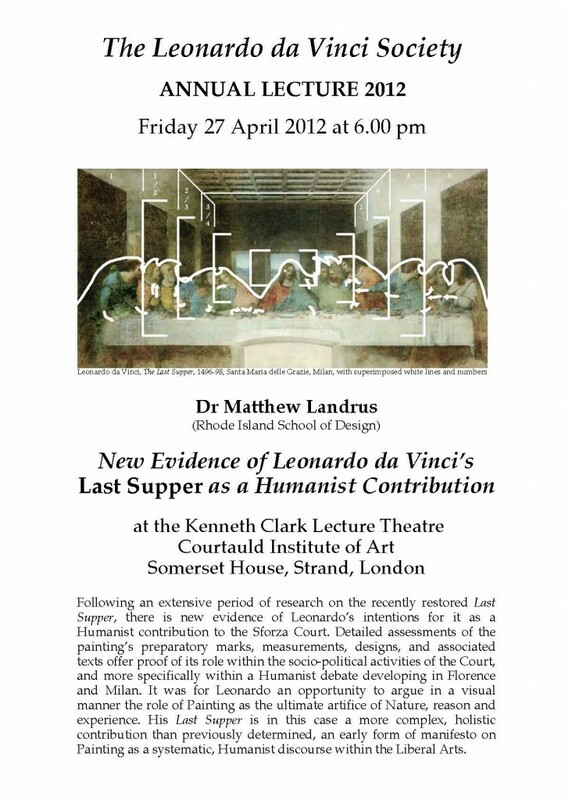 Landrus will give public lectures titled ‘New evidence regarding Leonardo da Vinci’s Last Supper,’ Leonardo da Vinci Annual Lecture at the Courtauld Institute in London this April and ‘Renaissance Structural Engineering,’ for the Institution of Structural Engineers, History of Structural Engineering Study Group, London in February. Landrus is the organizer and Co-Chair of ‘Souls and Spices: Asia in the Age of Exploration 1500-1650,’ A Session at the Renaissance Society of America Conference, Washington, DC to take place later this year.